This project was published in the late evening, Oregon time, on Thursday, May 8, with 11:59pm on the following Monday, May 12, 2014, as the deadline. 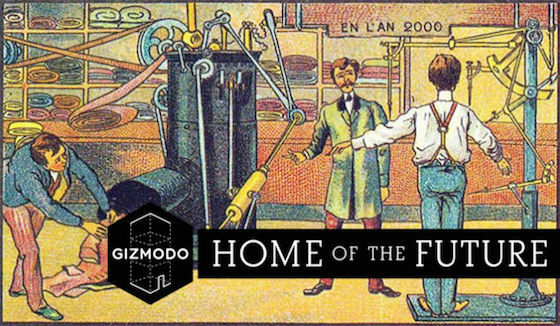 This week we’re helping Gizmodo explore what the future sounds like. Specifically we’ll be creating the sounds of the future of domestic life. From May 17 to May 21, Gizmodo is staging “an immersive, real-life” depiction of “the urban home of tomorrow” in New York’s SoHo neighborhood, at 268 Mulberry Street (that’s near the Broadway-Lafayette stop, for locals and visitors). It’ll be free to visit the site. Sounds produced for this week’s Disquiet Junto will be considered for playback in the Gizmodo installation. Step A. Roll a single, six-sided die. Step C. Compose a track of what you think that object will sound like, in the context of daily life at home three decades from now, in the year 2044. This means both the sound of the device in question, as well as the location (kitchen, bedroom, living room, etc.) in which the device would be present. This domestic soundscape should be between approximately 90 seconds in length. Er, and because this is an event for the general public, please keep option 6 family-friendly. Thanks. Deadline: Monday, May 12, 2014, at 11:59pm wherever you are. Length: The length of your recording should be approximately 90 seconds. Title/Tag: When adding your track to the Disquiet Junto group on Soundcloud.com, please include the term “disquiet0123-homeofthefuture” in the title of your track, and as a tag for your track.